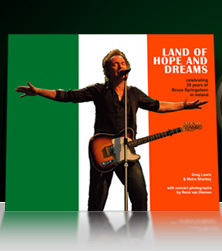 Irish portrait of Bruce Springsteen. Uncovers Springsteen's own Irish family history for the first time, depicting his astonishing 1985 show at Slane Castle as a triumphant 'home-coming'. It goes on to bring to life the nine Springsteen tours which have since included gigs in Dublin and Belfast, from E Street Band classics, to the foot-stamping Seeger Sessions and the thoughtful solo shows of the Tom Joad and Devils & Dust. The authors do not tell the story alone. There are contributions from fans from around the world. Each describe life-changing meetings with Bruce or band members, relive memories of the shows and reveal photos of Bruce from down the years. And central to the book are the amazing contributions from professional photographers, in particular René Van Diemen and Harry Scott, both generous supporters of the project, and dozens of unseen photos from fans themselves.